my new day time job of guiding senior citizens to thier beautiful meditative journey has taught me the impatience over time and the calm guiding grace of my gurus that must be shared. this newsletter is dedicated to my first siddha guru shekarswamy. 1. in our siddhar wisdom, the collective goodness is in these words, ‘anbe sivam’. the ancient language of tamil that is as old as sanskrit, if not older has over 60 words in ancient and present day words for love. of all these words, the most precious word is ‘anbu’. anbu is the love of oneness that is unconditional love. ‘anbe sivam’, the enlightened sages are. one with source and as love that shines like little child’s smile. like siddhaguru shekar swamy! anbe sivam to each of you! ‘ aum divine mother and father who gave this body, my gratitude! aum cosmic being who is in human form to be my higher wisdom, let me offer the fragrance of this food as our heart’s offering for thee in my inhale. in my inhale as the divine absolute, satisfy all the hungry stomachs all over the world. may all creatures be fed by this offering. inhale the fragrance of the food and quench all the hunger and satisfy all the living. may i know death as my divine friend who as a teacher prods me through births to find this wonderful birth to learn wisdom of the eternal. may the food be blessed! now as you eat, enjoy the supreme hunger as your stomach fire consumes the food on behalf of the world. abraham hicks, the friendly benevolant spirit would say, ‘the law of the universe knows intention as action and consistent intention as the focus to manifest.’ we manifest powerful dharma by our thoughts. lets manifest the heaven that we see as we throb as universal life. through our greater dharma of feeding many hungry stomachs as the instrument of perfection that seeks to connect the body with its greater receiving and giving. so the grace enables youthful wisdom that guides the yogi body in its first sheath, the earth element. spending a while selecting fruits for each other independant of each other. knowing and choosing with our hands the best fruit that each likes.this offering of fruits to each other and consuming these offering with the equal act of enjoying the receiving. fruits symbolize our mother natures most prized giving and we are spoilt in this inspiring country (that nandhi lives in) with abundance. if your heart is larger, go personally feed the homeless fresh fruits. the yogic reason behind this is that fruits are the offering of our earth element of body to the divine. so in all temples all over india, fruits are offered. 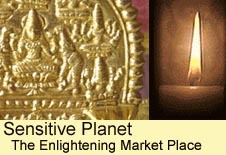 so with your visit in india to any sage or divine being. when going to amma’s, stop a while before driving into the ocean roads leading to her ashram and stop to buy fruits. offer her hermitage fruits! when meeting your divine guru from whom you got your mantra, offer fruits! if these chances evade or you are a more ancient being- find homeless, the hungry for love beings and feed them with the best fruits they may love. 4. sorry yogis if these words are intense. imagine standing up above the cold of the predawn thiruvannamalai mountain and offering the body’s inner fire to the divine fire that the mind holds to be one with the element of water and fire. even as the cold wild air whips through the near naked body. to acheive this in our daily worlds, choose a sacred day (once a week or for the ancient, everyday) and wherever you are- have a shower in the cold room temperature shower. alight the mantra fire and offer your body to your guiding absolute form. imagine the body and you consisting of 5 elements. as the water moves through your body visualize yourself as the supreme lingam of fire enjoying her as the creative force. move your consciousness above as dying. giving away this body, the past, the sins and boons..
as yogi, in absense of body and karma, our wisdom guides to enable the path in light. 5. this number five seats well. so that of oneness that is him. your first sun salutation that begins your yoga, offer your body. enjoy each pose as you feel the pleasures and pain of the body and say ‘wow’ from the heart to pay gratitude! pay gratitude to your mother and father who gave this body and your ancestors and worship the genes above the 7 generations. one of them would have had to be a saint in thier own way at thier own times and they will guide your intellect to your physical realm guru in tune with all your genes guiding you to be light. through your sun salutation ignite the muladhara fire and let youre breath of inhale ignite the fire further as the fire pot. ift this fire pot up above the navel and in this bandha, sing your mantra through every exhale as the body allows the goddess to pass while holding her presence through the giving and receiving of breath. this is the guru chakra. climbing above, enjoy her presence. through the third eye open the lock that hold by the mantra’s source and the perfected senior’s glance through our reaching energy within surrendered breath. this is the beginning and the end that of love body does the sun salution gifts. 6. when the day begins, go towards the sun and close your eyes. allow the sacred essence pour through at first your muldhara that is activated by breath. now rise the sun light within through each chakra until you see the light’s presence as above in the sahasrara… the thousand pets above the crown chakra. now build your perch above at the third eye with your eye lids still closed. opening your eyes, enjoy his allowing grace. now he may unfold for you even several hours of his cool moon like radiance. absorbing his light, begin your day so as wisdom each though is guided. 7. as the curtain lifted in a dark room are these words to allow light to come. for it always has been there. her worship is the every evening or morning disciplined by the lighting of the lamp. so in this physical reality she may shine through our household as our mind and the surroundings. 8. in the tiredness witness the body asking for sleep and also the rejoicing in the waking state. in the wedges between is the state of turiya. that which is within as already there is the supreme master. this allows us to be witness to a daily death like sleep. 9. and now for our wonderful goddess who chooses this dimension in number as the sacred trinity in the three dimensions! many years back, as i was sleeping in the cave after wonderful intense worships, i was woken up by this wonderful sage, sri janardhana swami. he would welcome anyone of you should you step into his cave- mamara guhai. pls convey nandhi’s love as you offer your joys by laying down at his feet. he would love to feed you any time you are i his cave- pls do not refuse it. enjoy the sacred prasad of the goddess who guided sri ramana maharishi over six years of his nishthi. nishthi is the depth in samadhi to be the cosmic womb. anyway, sri janardhana swami woke me up saying, ‘hey divine friend, wake up- my guru and his guru friend have come. seek thier blessings and grace for they have been in silence for over 15 years. to you they will want to reveal. go to them’. slowly they came alive. i knew that i had to leave india to settle in america and i would need every blessings my human entity could mop up! i waited and just simply waited. one of them spoke, ‘of what use is our silence if it is not for benefit of the earthly realm’. them wisdom poured and poured as their silence became pearls of wisdom. towards the end of our conversation the sage representing the other two sages said, ‘know a yogi’s journey to worship life. our message to the world you will soon be in is this- ‘saivam vetri’. when humans achieve knowing this, the age of the angels begin. each as christ. each as the yogi/yogini. each as compassion to all the living. peace be to the world’. to be saivam is ahimsa. to be saivam is to be one with our supreme being, the holy ghost, siva. to be saivam is to know the union of all life and ourselves as the rejuvenative healing fire kept kindled. vetri means victory like a light switched on that dissolves millions of years of darkness before it. knowing these sacred thoughts through the goddess of navrathri, the holy ramadhan of islam, the mystical joys of rosh hashana. there is no coincidence in this convergence of time. they are the collective wisdom prayer of humans wishing to usher peace through each individual’s awakening. the awakening that transcends written knowledge. receive the sacred words from our spirit recognizing the higher guiding principles beyond collective ego of second hand witnesses who write in the ego passion that enslaves. dance as a sufi throwing all to allah and the countless named divine residing as all living so in kindness is peace that fosters the energies that evolve our civilization. all begins within. in her sacred grace when find our yoga to be within One. a yogi’s quest to find oneness is in absolute terms seeking to be one with all the living. in this quest is to feel the pain and the pleasures of all animal life, so tantra is born. so is vegetarianism our greatest and most true giving to our cosmic world that we live in. transforming sacred joys to each of you!